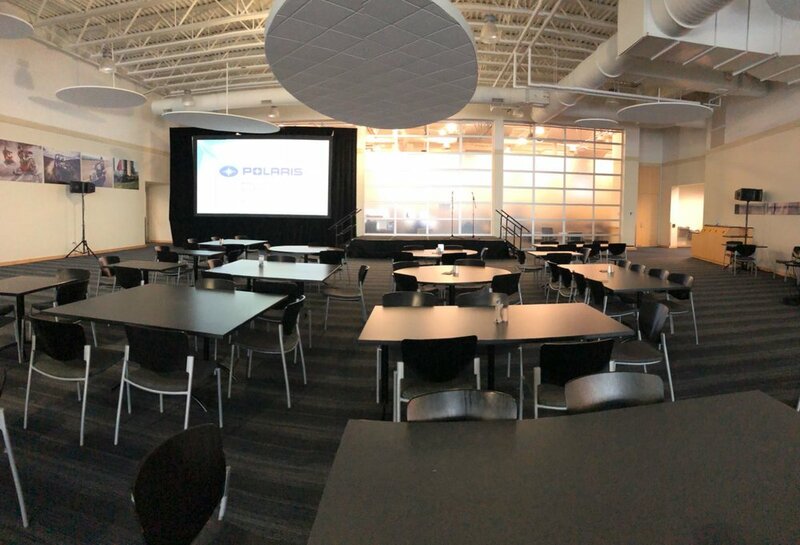 AV for You set up audio, video and staging for a corporate event at Polaris in Wyoming, MN. For audio the client rented speakers and microphones. For speakers they rented four JBL VRX900 Line Array Speakers and two QSC K10 powered speakers. For microphones they rented two Shure Handheld Wireless Microphones. We also provided a Mackie 1202 12 channel mixer. We also supplied video rental equipment including a projector and screen. We projected our Eiki 7000 Lumen HD projector onto a Screen Works 9 x 16 Truss Screen. The client also needed to rent staging from us and we constructed a 8’ x 16’ stage with stage steps and skirting. The stage was made up of eight of our 4’ x 4’ stage decks.